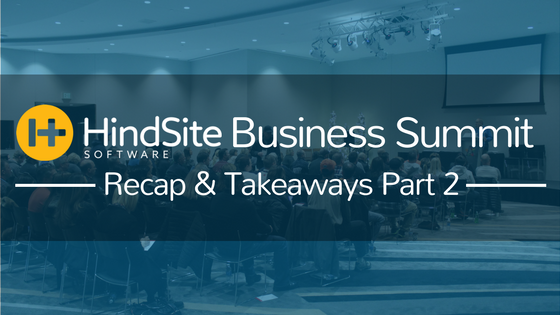 Last week we posted Part 1 of our HindSite Business Summit Recap & Takeaways, focusing on the breakout session where HindSite experts explained the benefits of using new or under-utilized features. Here, we’ll be taking a broader view and looking at the future direction of HindSite in respects to our customers. HindSite’s CEO & Founder, David Crary started his talk by saying “what’s most important is how your business uses the info [HindSite] software provides”. He went further, talking about how the only way HindSite can continue to expand it’s functionality, is by listening to our customers’ feedback. The goal is to always provide what you need to have a competitive advantage. Keeping with the theme, Mike Van Ordstrand, HindSite’s Director of Product Development, kicked off his talk saying “development’s objective is to streamline data flow around your [business’s] workflow - tying pieces together while using less steps”. It’s not just about having data and information, it’s about having the tools and ability to integrate the data and information into your business model. Throughout the two days of the business summit, our team kept noticing that the level to which our customers use HindSite varies. Some use it only for scheduling, while others use it not only for scheduling but customer communication and business management - of course many fall somewhere in between. It doesn’t matter where you’re at, what matters is how we can help you improve your business. David broke it into three levels, as you can see in the above figure. The first, is using the software (and app) for purely field operations, whether that be scheduling, collecting information or employee communication. 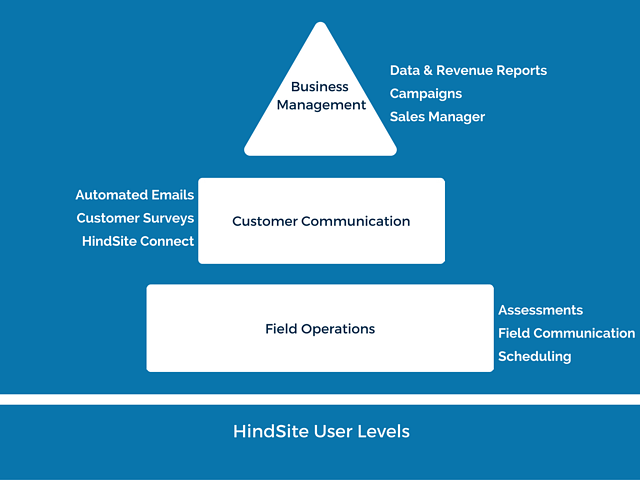 The next level is expanding the communication portion of HindSite to your customers by using Connect and automated emails. The last level of Business Management is something we have been and will continue to focus on (more and more) moving forward. Or as Mike simply put it “we care about the owner a lot more now.” Before - for the most part - it was all about field technicians and office managers. The answer to “how can we help the owner” can be seen in the updates and release of Sales Mananger, Tracker and Revenue Reports. These features provide owners with a broad view - revealing areas where they can improve and grow their business. While trying to think how I could properly conclude and sum-up three days of engaging conversations and plenty of learning (by both HindSite and customers alike), I stumbled across a letter that every customer received as they left the Summit. It was from our CEO & Founder David Crary. And it's better than any conclusion I could write. We take pride in our customers, we understand what it takes to own and manage a small business and we understand some days are not as fun as others. And on those hard das we want to help. We want to be that family member that you turn to (for help). We know that we are both stronger working together - solving problems and overcoming obstacles. Every day we work with very smart clients that provide us with new understandings of some of your issues - issues that you might not have thought of. We are happy to share their knowledge. And we recognize that the more successful your business is, the more successful HindSite will be. Thank you for being a HindSite customer and thank you for taking the time to join us at our business summit.